Are you in the market for a new PC or Mac but aren’t sure what to buy? Scott Henke teaches basic computer classes around town. In our personal shopper service Scott personally will help you find the best option for you according to your needs making sure you are not getting taken advantage of, and that you don’t buy more or less than what you need. Here is Scott’s handout from his classes which can help you make your decision. If you would like the personal shopping with Scott, it is $80 for up to 2 hours, and needs to be scheduled through the office. 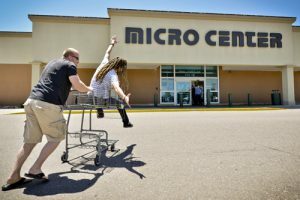 Micro Center is the best, and really ONLY, true computer store in Colorado. They have a HUGE selection of both Apple and Windows computers. Plus, since we purchase over $150,000 per year from them, they are more generous with our customers to take care of post-sales issues that may occur. This is why we ONLY recommend buying a computer from Micro Center.